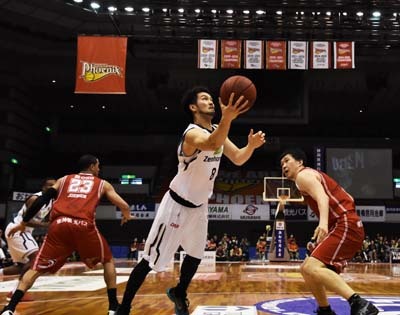 Ryuichi Kishimoto scored 14 points on Sunday. Golden Kings made a new franchise record of consecutive after piling up the team’s 16th win Saturday in a road game against Hamamatsu Higashi-Mikawa Phoenix. The numbers were 74-56. 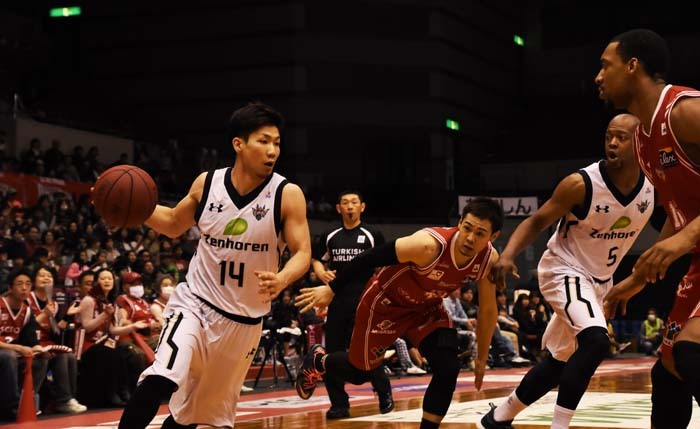 However, the team’s joy was short lived as Hamamatsu managed to get its act together on Sunday when the numbers were 77-84 for the hosts who thus ended the Kings’ winning streak. Shuhei Kitagawa poured in team-high 16 points on Sunday. The loss on Sunday also leant that the Golden Kings dropped to the second place in the conference and it made demote to second place in the conference. 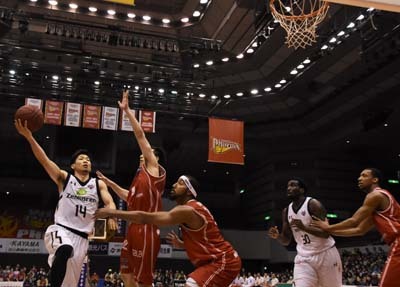 On Saturday, the Kings knocked down Hamamatsu, the defending champion of the last season. Although the Kings scored just 9 points in the first quarter, they geared up to speed from the second quarter, and piled up over 20 points in each remaining quarters. Their defense also worked well, and forced the opponents’ down to less than 20 points in all quarters, and it made all the difference. Golden Kings Head Coach Tsutomu Isa was happy for the end result but, even though the gap was 18 points in the final count, he said that the offense did not work the way it should have. “We got missed a lot of situations in our offense, and created bad stream of play all by ourselves,” he lamented after the game. His foreboding was justified. On Sunday, the Kings lost to Hamamatsu 77-84, and their consecutive win record stopped at 16. Also, on the same day, Kyoto Hannaryz won against Takamatsu, and claimed the first place in the conference on their point spread although they have the same number of wins and losses as the Kings. The Sunday match started good enough. In the first quarter, mainly Evan Ravenel piled up scores and the game was 23-13 at the end of the first quarter. But from the second quarter the game started going bad as the stream went to Hamamatsu’s favor, although at the halfway point the Kings still were in the lead by one point. Kishimoto wreaking havoc under Hamamatsu’s hoop. Turnovers were the straw that broke the camel’s back. Hamamatsu had six turnovers against the Kings’ 16. As the game proceeded, Hamamatsu got better with their fast passes and assists, and made free marked shots well. Towards the end, the Kings managed to narrow the gap to just 4 points in the fourth quarter, but they finally lost with 7 points behind. After the game, Isa admitted that even though the Kings had a good stream in the first quarter, Hamamatsu set the pace. 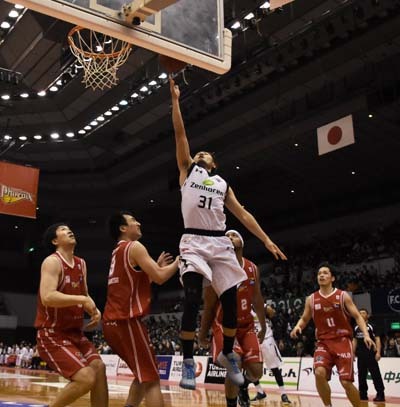 “We had a few chances to reverse the game, but in the end, Hamamatsu kept a good control of the game,” he said. Kings will face to Osaka Evessa this weekend on the home court in the final game of the regular season. Next year, the Ryukyu Golden Kings will play in the first division of the new three-tier B. League that is the new Japanese professional basketball league that replaces the current two separate leagues.